In “Jesus and Taxes: The Temple Tax,” we examined the first of Jesus’ statements about the duty to pay taxes. In that instance, Jesus began by noting that he was not obligated to pay the tax, but then instructed St. Peter to pay the tax for both Peter and himself. This instruction to comply with authorities–for the purpose of avoiding needless offense–would later become a common theme throughout the New Testament. Later the gospels give us Jesus’ better-known response on paying taxes to Caesar. When they heard it, they marveled; and they left him and went away. Matt. 22:15–22. “Caesar’s.” they reply, for the coin contains Caesar’s portrait and the inscription: “Caesar Augustus Tiberius, son of the Divine Augustus.” One wonders if Jesus’ countrymen felt any hesitation in producing one of these coins. It contains a graven image (highly offensive to Jews) and identifies the image as depicting the son of a god. They may or may not have appreciated the blasphemy. Now imagine Jesus’ apostles standing nearby. They still have St. Peter’s confession ringing in their ears: “You are the Christ, the son of the living God,” Peter had said to Jesus. Matt. 16:16. The irony is sweet to consider: the enemies of the real Son of God being compelled to show Jesus a picture of the phony son of god. One would think Jesus’ enemies would tire of trying to match wits with him, but they really wanted to get his answer to their question. Finally, Jesus answered: “Render therefore to Caesar the things that are Caesar’s, and to God the things that are God’s.” This might have been an unambiguous answer if Jesus had first clarified exactly what was Caesar’s and what was God’s. The Catechism of the Catholic Church—in supporting the payment of taxes—never suggests that this incident supports paying taxes. 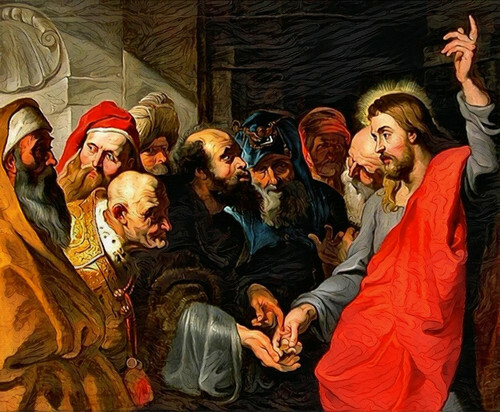 Despite the ambiguity of Jesus’ answer, this episode has often been seen as endorsing the payment of taxes to Caesar, yet Jesus never suggested—as have some commentators—that Caesar’s image and inscription on the coin proved Caesar’s ownership. We could even assume that the coin initially belonged to Caesar. Perhaps the coin had been struck in the Tiberius Family Mint at some point, and that Caesar had spent it in exchange for goods and services, thereby transferring ownership rights to the new holder of the coin. In this instance, the coin reasonably belonged to the man who produced it from his pocket. It no longer belonged to Caesar. Even the Catechism of the Catholic Church—in supporting the payment of taxes—never suggests that this incident supports paying taxes. Indeed, the Catechism relies on these verses to assert the duty of a Christian to disobey the “civil authorities when their demands are contrary to those of an upright conscience.” CCC ¶ 2242. If justifying coercive taxation by the state were an authoritative reading of the passage, the Church would certainly have cited it for that proposition. Since the main lesson of these verses relates to our duties toward God, there still remains the puzzle of how Jesus’ answer should be taken as regards the payment of taxes. The answer depended on who was listening. Jesus’ command to “render unto God the things that are God’s” would have underscored—in the mind of a first-century Jew—that weighing Caesar’s title to the tribute coin (or to anything else) against God’s ownership leaves Caesar with the short straw. Truly, Caesar has nothing. Hearing Jesus’ answer, the people would never have mistaken Jesus’ response as an endorsement of paying Caesar’s taxes. This accusation was not strictly true—for as is clear from the Temple tax incident—Jesus did not actually forbid paying the tax, but only questioned the legitimacy of the tax. Caesar—and every ruler before and since—simply had no just right to take, by force or threat, other men’s property and wages. Yet the Church tells us to submit to state authority when our conscience permits. Just as Jesus said to go ahead and pay the tax—because his mission required that they “give no offense”—his apostles would later do the same. This is a theme that resounds throughout the letters of the New Testament, and the history of the Church. We will examine the reasons for this submission in future posts.